| Keith Beneath: Housing. Economic Justice. Thermonuclear Class War. Read SF Weekly and Hoodline‘s exclusive interviews with Keith Beneath. Keith Beneath is a musician, performance artist and venture socialist from the San Francisco Bay Area. 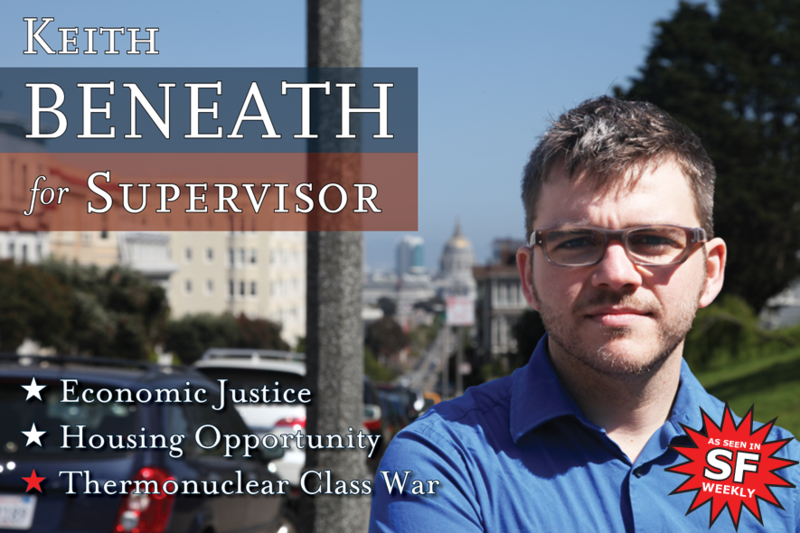 He is currently running for San Francisco City Supervisor (District 8) on a platform of economic justice, civil rights, a right to housing and jobs, and the detonation of a small nuclear device in Silicon Valley. Listen to/watch beautiful Keith Beneath music. Fall in love with Keith Beneath.